SpeedUpMyPC Does What It Says...But Is The Price Right? It's arguable as to whether any optimizing program will save you more time than you spend using it, especially when it sits in the background "optimizing." That's true even when the product is as nicely put together as Uniblue's Powersuite 2013, which takes the functionality of the company's SpeedUpMyPC system optimizer and tweaker and builds on it with both a disk optimizer and driver updater. Powersuite 2013's interface is handsome and logically laid out. Powersuite 2013's tweaks covers settings, unnecessary process reduction, visual and launch optimization, and registry tuning. Just about everything you'll run across when researching Windows performance tweaks on the Web, has been included. The program also looks for processes such as umrdpservice (remote desktop printing) that are commonly unused and can be disabled. Powersuite 2013's registry checker found many unused entries that the free CCleaner did not, but missed about 50 that CCleaner found. Unlike CCleaner, Powersuite 2013 has a registry defragger, letting you eliminate any wasted space in the registry created by removing entries (which also happens with normal uninstall operations). There are four tools that function only while the program is running: CP2U manager, Software launch booster, proactive thumbnail generator, and Start menu accelerator. The first is supposed to prevent CPU hogging; the second to reduce application launch times, the third to create icon caches, and the last to reduce lag on the Start menu. Powersuite 2013 also has a disk optimizer, but it doesn't seem any more capable than the one included with Windows. There are more powerful and configurable defraggers, such as UltraDefrag, out there. On the other hand, the Powersuite 2013 driver updater found some outdated motherboard drivers that Windows update had not. That was a nice find. Uniblue's Powersuite 2013's biggest problem is price. $90 ($60 on sale at the time this review was written) is a lot of money for a suite that adds only a disk optimizer and a driver updater to the $30 SpeedUpMyPC's tweaker and registry cleaner. Uninstalling your toolbars and other software detritus, then running the free CCleaner and integrated Windows tools, is a lot cheaper than either. 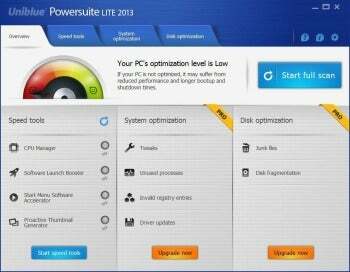 System tweaker and optimizer Powersuite 2013 works, but it's pricey.